A visit to this lovely nature reserve in spring and summer is enough to make any visitor gush about it reminding them of how countryside used to be! The countryside in Wales and indeed elsewhere in Britain was certainly richer in wildlife - and wildflowers in particular - in the now distant past of my childhood, but I don't remember anything quite as good as this from my formative years. We should be very glad that this reserve is protected and looked after, because this kind of wildflower meadow is becoming ever more rare as the years pass. The nature reserve was purchased with support from Timotei, and is run by Plantlife and Natural Resources Wales (NRW). The nearest town to Cae Blaen Dyffryn is Lampeter, and you should proceed from there on the A482 in the direction of Llandovery. The best landmark to look out for is the Ram Inn, on the left hand side of the road, and the reserve is about 4km (2.5 miles) further along, also on the left hand side. There is no official parking close to the reserve, but we usually park on a rough area of ground on the sharp bend immediately before the meadow itself. Please note that it is a dangerous turn into the area and an even more dangerous one coming out due to your restricted view of any traffic approaching from either direction, so please take great care if you decide to use this parking area. Alternatively, there is a layby on the left hand side of the road a short distance beyond the entrance to the reserve. Wherever you park you will need to keep your wits about you as you walk to the reserve as there is no pavement on this narrow but extremely busy road. There is a gate and a stile at the entrance to the reserve, but there are no clearly defined footpaths to follow in this steeply sloping meadow. The area at the bottom of the site, nearest to the road, can be very marshy early in the season and after prolonged rain so good walking shoes are essential. Not suitable for wheelchair users or for people with prams or pushchairs. 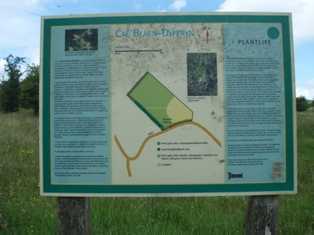 There are no facilites at the reserve apart from an information board. There are shops, pubs, cafés and public toilets in Lampeter. The type of meadow found at Cae Blaen Dyffryn was once common in Southwest Wales, but pressure from modern, high-intensity farming methods has contributed to a devastating degradation of such habitats and, as a result, of the species of wildlife that are dependent upon them. Cae Blaen Dyffryn is best known for its special plants, which include the Greater Butterfly-orchid (Platanthera chlorantha), the Lesser Butterfly-orchid (Platanthera bifolia), Moonwort (Botryichium lunaria) and the Mountain Pansy (Viola lutea), but many other lovely and interesting plants grow there too. 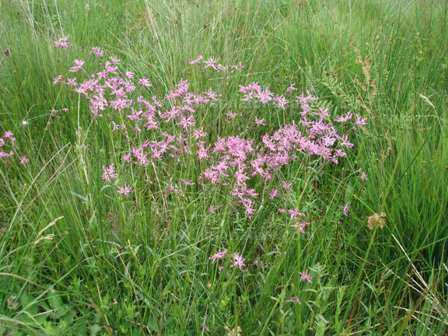 In early spring there is Ragged-robin (Lychnis flos-cuculi) and Pignut (Conopodium majus), while later in the summer the Butterfly-orchids are joined by a host of other wildflowers including Yellow-rattle (Rhinanthus minor), Common Cats-ear (Hypochaeris radicata), Tormentil (Potentilla erecta) and Common Bird's-foot-trefoil (Lotus corniculatus). 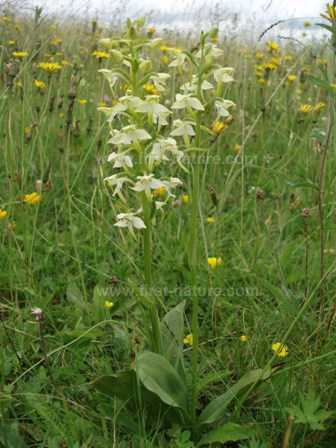 Other orchids found on the site include Common Spotted-orchid (Dactylorhiza fuchsii) and Southern Marsh-orchid (Dactylorhiza praetermissa), and it is also thought that they hybridise to produce the extremely robust and confusing orchids that are also found in the meadow and have been tentatively identified as Dactylorhiza x grandis. Today Cae Blaen Dyffryn is managed to conserve the plants and the wildlife that live there. Appropriate grazing of the site is carried out by ponies and donkeys to ensure that rank weeds don't flourish at the expense of the special plants. The work is closely monitored to make sure that the management programme is effective, and each year Plantlife staff turn out with a group of volunteers to help count the special plants that the meadow supports - in particular the Butterfly-orchids.